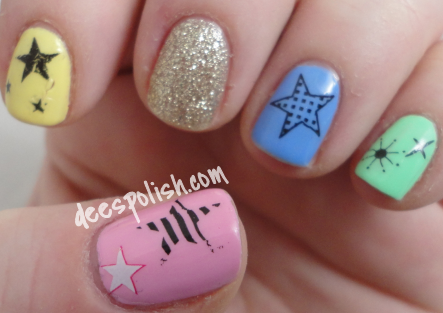 Today I bring you a post featuring some neat star decals from Born Pretty. I took the following items.. aka these nail decals, and my painted nails.. They look pretty rad.. but two issues. 1. The pink stars.. did not show up pink.. or this hand or my other.. I did a wealth of tests. I have had a full set of decals from the store do this to me. They go on backwards. And this was even following the full directions.. using the blow dryer and everything. A touch disappointing. That is why on this hand (my photographing mitt) I only went with one "pink" star.. because I didn't want white stars all over the place.. although it does kind of look interesting.. like.. a pink 3D effect. Anyways. 2. I should not have topped with Seche Vite. Why? Well, it ate away at the decals - seen most noticeably on my index finger. It also ate away at the outside. Who knew Seche Vite was so potent? Still love it though. I probably should use a base coat clear polish next time instead. Despite these 2 mishaps, I still quite like the nails as a whole. 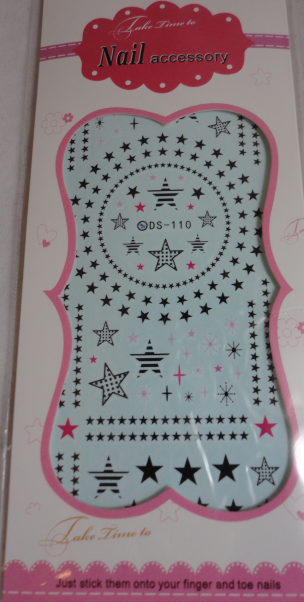 The decals are cute - even the solid decals, though I am partial to the stars with dots. I just love dots! These are used like most water decals, follow the directions on the back.. plunge in water, apply to nail, blow dry, etc. I like water decals. They add extra activity without being a lot of extra effort. So long as your nails are dry. I remember one time, back in my very young days, when I didn't wait for my nails to be dry.. not a good time. You can scope these decals out HERE - and hopefully have better luck with the cute pink stars. That is all for today -- see you all again very soon! P.S - Free Shipping.. and.. a nice discount of 10% if you use the code AHB10. Who doesn't love a nice deal? ?